Our review of the best that AGV has to offer, the AGV Pista GP R. The AGV Pista GP R is the helmet of choice for top level riders like Valentino Rossi. This is perhaps the best full face, racing specialised helmet available today. But just how good is the Pista GP R? We have taken a deeper look at this helmet in our review. Ladies and gentlemen, Champion Helmets is proud to present the AGV Pista GP R helmet. This is a full face racing helmet designed for the track, by track riders. This helmet has some serious pedigree and is even worn by Valentino Rossi. AGV/Dainese has a great selection of racing gear and they have topped it off with the GP R, which is an improved version of the Pista GP. There were not any significant changes between the Pista GP and the GP R but the changes tended to focus upon improving the overall quality. The Pista GP was already an amazing helmet, so there weren’t too many changes needed. So I will stress that this is a racing focused helmet and has been designed as such. Do not expect the comfort, ease and noise isolation of a touring helmet here but remember that this helmet will get you safely and comfortably around a track at near Rossi speeds. Now, let’s start with the shell. First of all, the shell is completely made out of a carbon fibre composite. Carbon fibre is of course, extremely tough and light which makes it perfectly suited for the track and represents the best material a shell can be made of. The helmet weighs in at about 1300-1400 grams which makes it quite light and there are also 4 different shell sizes. This is of course, a very aerodynamic helmet and we have a biplano spoiler on the back to cut through the air. This gives the helmet excellent stability at high speeds in a low riding position and has been a result of being wind tunnel tested. Now remember this is a racing helmet and should be worn almost exclusively in a low riding position and the lower the better. Ventilation is a key focus of racing helmets and the Pista GP R strikes a good balance between ventilation and just sticking vents everywhere. It is called the IVS or Integrated Ventilation System and is a strong aspect of this helmet. The chin vents stick out quite aggressively and literally force air onto your visor via the breath guard. You can also open and close the chin vent on the inside of the chin. Moving up we have 3 metal air vents to bring in fresh air to the top of the head and travel via channels in the EPS out of 2 rear exhaust vents. There are not any sliders or anything though to control these vents. Instead we have rubber stoppers which you have to place before putting your helmet on. Again, this is not a problem on a race track but on the road, it gives less flexibility and this is a track focused feature. The vents on top and on the back also made of metal on the GP R which looks nice but also strengthens the area. Noise isolation is actually pretty good on the AGV Pista GP R. If, you wear the ear plugs that AGV has provided... Noise isolation doesn’t really matter on a race helmet though and because of that, we have a helmet which is loud but not unexpectedly so. If you look underneath the helmet, you will notice the quick release system for the cheek pads. This is a nice plus for safety, then there is the integrated hydration system. You can hook this up to a camelback system and stay hydrated while you ride or just remove it if it bothers you. The inner liner is also a plus, it is antibacterial, moisture wicking and can be personalized. It comes out in 2 pieces and provides a snug racing fit. This helmet should grab your face and not let go at high speeds. Now for personalization. This pad can be changed using 2 Velcro straps, then inserts can be removed and finally, you can chuck a big pad into the back of the liner so that the helmet will hug against the back of your neck and head. Overall. We can do a few things with this liner. Now we come to safety. This has been a major feature and the Pista GP R is designed to keep Rossi safe so you know it will be the best it can. The shell is carbon fibre like I mentioned earlier but the EPS liner is multi, multi density. You get 5 layers of EPS each with different densities which will protect you better over a larger range of impacts. Despite being a racing helmet, you can also wear this on the road. It has an ECE and DOT rating plus a 5 star SHARP safety rating. Overall, you could be safer blasting around the track with this helmet on than walking around a track in the case of an accident. We have the emergency safety release system as well as a thick visor and also a double d ring enclosure system. 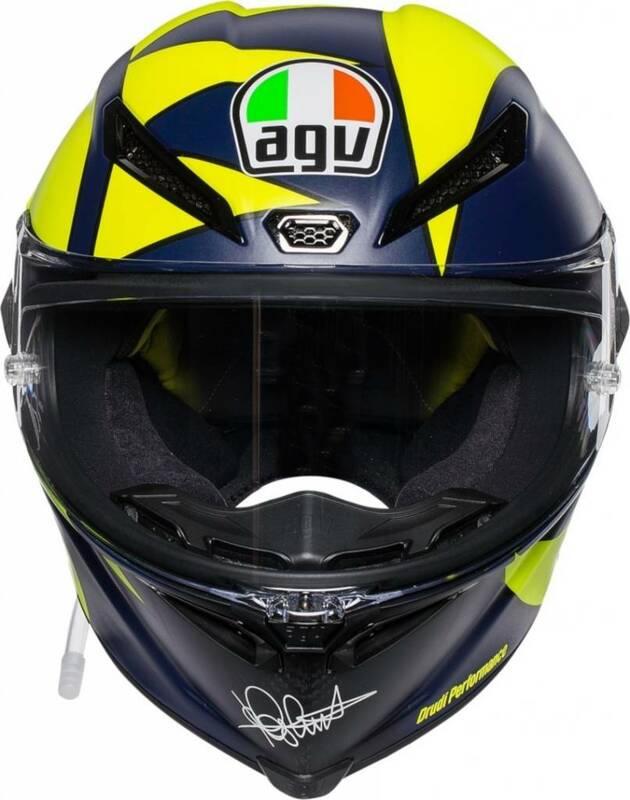 AGV has provided us with top quality safety with the GP R.
So there are plenty of designs for this helmet as well. If you are a Rossi fan, then you will find plenty sporting that big 46 or any of his other designs really. You can check out our top 20 Rossi designs video if you’re interested, where we showed off quite a few Pista GP R designs. Even if you aren’t into Rossi, there are other options associated with Moto GP and non-Moto GP designs. The helmet has a super sporty look thanks to the aggressive chin vents, and that big spoiler too. Overall, the look matches the purpose. Now this is a great helmet but there is one downside. This is a highly priced helmet and RRPs at about 1400 USD without a design. This is anything but entry level and compared to the Shoei X-Spirit 3 which has a RRP of about 750 USD. There is a large price tag on the Pista GP R. I would rate the GP R above the X-Spirit in terms of quality but the Pista GP R is definitely in the premium, premium price range. If you need the best of the best, you have it here though. This is the Ferrari of motorcycle helmets and will have other riders nodding their heads as you go past. I have stressed that this helmet is designed for the track throughout this review though. Now, I won’t tell you what to do with your helmet but you should recognize that this is made for aerodynamic performance, safety and stability when racing, not cruising. This is a highly specialized helmet and has been purpose built to race. You can combine it with a Dainese racing suit too if you really want to look the part. 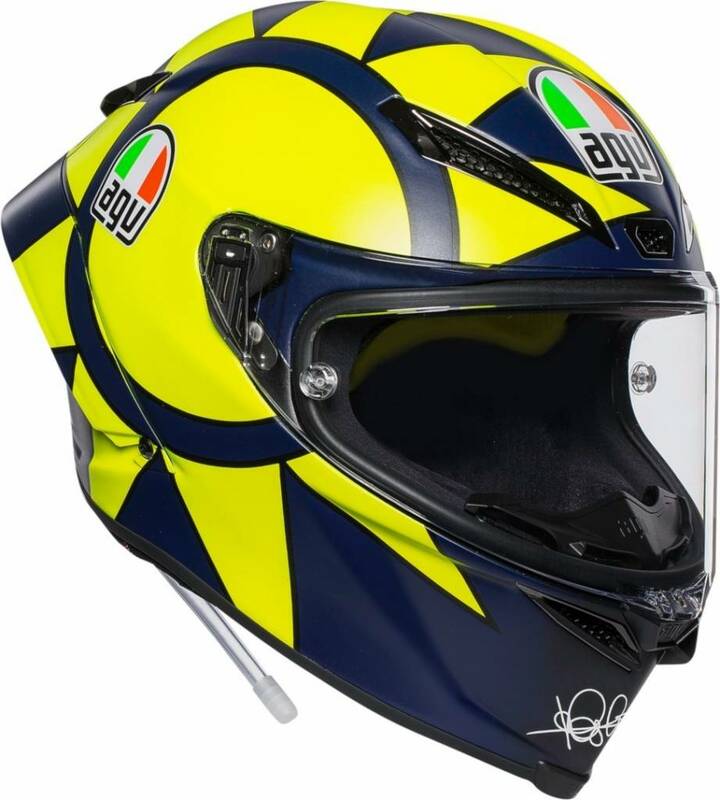 If you want to pick up the AGV Pista GP R you can get a pretty sweet bundle with the helmet as well. You can get a free visor or even a Cardo Packtalk Slim for a pretty hefty discount. Be sure to check those out if you are looking for a Pista GP R.
So this has been our review of the undisputed king of racing helmets. If you would like to see more check out the AGV Pista GP R page or the film on the top of this page. Race safe!